I am not finding this option in my settings, battery, advanced. I tried putting my phone on a quick wireless charger but that did not kick in the option. When I go to device maintenance and the three dots I don't get anything for charging. When I click on battery and advanced, you can see the wireless charging option is not there. skatergirl and Beansr519 like this. I put it on a fast charging pad and it did not activate it and I have searched it and nothing comes up. My Note 8 charges fast on that pad and has the option for fast charging in the battery settings. Using the same cable and brick the stand came with? If so try a reboot see if everything goes back to normal and fast charges. When I put my Note 8 on the pad, the phone said fast charging. That's strange note 8 picks it up but not the note 9 ...got look through again In settings. You aren't [yet] on Pie which has improved this area a lot. I've had trouble with Settings on both Oreo and Pie betas that led to resetting to clear glitches - some serious as Settings is essential and indispensable. Any 3rd party app might be involved in charging a d battery? 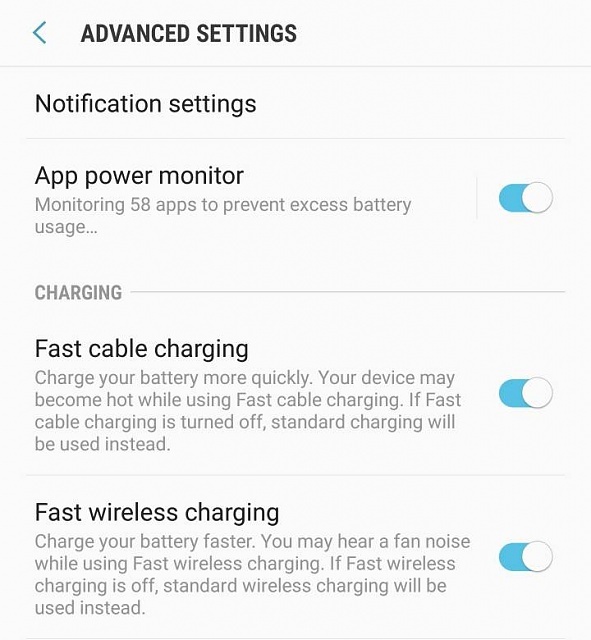 Do you mean fast wirelessly charging the Note 9? If so you need a fast charging pad, a fast charging plug/ adapter AND a cable that is cable of fast charging. Then, it will work. My set up is an Anker wireless charging pad, an Anker USB to micro USB cable and the Samsung fast charger plug that came with the note 9. This fast charges wirelessly every time. Often where people struggle is because the cable isn't good/ fast enough. The pad and the cable are both available on Amazon (separately) and are really good value. I love Anker products. Cheap, top quality and durable. I also have two of their power banks for charging on the go. Really fast. By the way, I am still on Oreo. Okay, so after placing the Note 8 back on that pad, I am not seeing fast charging. So, perhaps I misread it. The charger is old. It does charge but not fast charge. I ordered a new fast wireless charger today. As soon as it gets here, I will update my post. Thanks so far for your help. Your welcome, keep us updated. After reading your helpful post, I decided to look at the charging block. I moved twice between July and September and things got a bit scattered. I went to the garage and dug up a quick charging block and it works. My phone has been activated with the fast wireless charging and now I can give my friend this older charging pad because I think he is going to buy my Note 9. Now if I can just get my Galaxy watch to cooperate. I had it GREAT finally, after a month of pain and torture, and then I got the new phone and had to reset everything. Today I force closed all my apps and cleared all the cache in hopes I can get this watch working again. I am really starting to hate it. Oh dear. Good luck. So many people have had various issues with the Galaxy Watch. I think I've just been lucky. Everything works, although I've had to figure a few things out. I think it's amazing, but as I say, maybe just lucky. My main gripe was heart rate when exercising but I seem to have sussed that out too (fingers crossed it will stay that way). At the end of the day, if a device is causing you more hassle than enjoyment, it's not worth it. These things are supposed to make our lives easier and add a bit of fun, too. I love everything about the watch but the step tracker. I don't use the heart rate monitor. I am hoping Samsung will finally just come out with an update that addresses all these things. I hope they do, too. And I see you saw my post in the Galaxy Watch forum regarding the response from the Samsung rep who works in the office of the president. Lol, getting Samsung to do the right thing is like getting our government to do the right thing. No one wants to take responsibility. mustang7757 and jimd1050 like this. Don't get me started on POTUS! kct1975, sonnnet and skatergirl like this. Advance Feature and then Under accessories.